It seems like just a few years ago that she lost her front teeth. I spent the 14th to 17th years frowning at the task of raising a strong-willed teenage daughter. I still haven’t created a photobook from her high school or college graduations. She’s getting married next year. It feels like yesterday, but time is a sprinter. This week my first born, Alexandra, turns 25. I am filled with gratitude at how blessed her father and I were to conceive a healthy child. Every day has been a gift, one I never underestimated or took for granted. Motherhood remains the part of my life I am most proud. On this milestone of 9125 days I thought I would list 25 things I adore about my daughter. She was my recurring dream from the time I was nine years old. I knew a blonde haired blue eyed baby would arrive to this brown haired, brown eyed mother. Her name Alexandra Ivy connects her to family history. She’s named after her maternal great grandmother (Alexandra Landi Camuti) and paternal grandmother (Ivy Carpenter) consecutively. Although she likes to be called Allie, I only call her Alex. Her hazel eyes that were originally blue for a year. A baby’s eyes smiling at Mom is like a sunrise that’s always perfect. She said, “Mamma” at eight months, and “balloon” at nine and was reading flashcards before 18 months. She had a sleep song as a baby, humming through dreams. A Daddy’s girl to the core, life was all about her father, grandfather, great grandfather. She adores her bonus Dad, Rick, whom she calls Big Daddy. A true foodie, Alex is one of the only women I know who never makes me feel guilty about eating. Life is to be tasted. She knows how to hit the pause button and ask herself if she’s being true to herself: Is what I am doing now going to support my highest good? (Dang, I was in my 40’s before I could do that?) I applaud her for the fact that sometimes she realizes she needs to change in one area of her life and puts the work in to make it happen. She appreciates my philosophy of keeping a home organized and clean. She went to my alma mater and won a communication award named after my college mentor. Mamma Proud. She is a travel bug. In the second grade she read an American Girl book series about a girl named Felicity and convinced us that we should spend Christmas in Colonial Williamsburg. She wrote letters to Santa telling him to meet us there and not forget her little sister Helen. While Colonial Williamsburg is an empty nester’s vacation spot during the holidays we had a blast sharing our trip with all the couples who wished they were grandparents already. I predict that Alex will have more luggage than designer handbags throughout her life. Passports are meant to be worn out. She is elegant, dignified, refined and carries herself well in any social situation. She loves cats. Dogs are cool, too. She is a self proclaimed geek and admits it. If there is a new game to play, a gadget to be tested, or a social media platform to chat on, she’s on it. Alex owned her first computer – a little toy number that looked like an original Mac – at the age of one. The “puter” was as important as her favorite doll Cindy Lou. I love the way her hands float when she has a fresh manicure. She is the most amazing writer. Breathtaking really. She has the well-written ability to reawaken your senses with her words. She’ll make you think about your own perspective on the world. I always say that if I need a tough editor to beat up my work I will turn to Alex first. She is BFFs with her sister Helen. Sometimes they just need to climb under comfy blankets and talk all night. Although she doesn’t give herself enough credit, Alexandra is a fantastic artist. I framed the poetry she wrote in the fourth grade, hoarded the pottery she fired in high school, sometimes download her photos from Facebook. She took her first college course in the tenth grade. She is constantly challenging herself to learn something new. Whether it’s personal training, creating vegan smoothies, tackling marketing budgets, challenging her fingers on a guitar or simply learning to appreciate the value of down time, my daughter is constantly blossoming in a way that surprises me. She has faith in God even though she hasn’t always embraced the Catholic church. She has always challenged her faith in practice, even to the point of participating in other churches. I want my children to have faith in their life, even if they find it elsewhere. Alexandra has the gift of being a true communicator. She knows the value of staying connected to family and friends. Sometimes you have to stop what you’re doing and show up for others, even if it’s inconvenient. I never have to explain this to her. She has found the man she wants to build a life with and is working to ensure that the foundation is strong. She looks so beautiful and radiant in love. The warmth on her face. The concern she has for her sweetheart. I love the way she teases with him and he teases her right back. They laugh a lot together. There is a love-fueled energy about them. They spark when they’re about to go on an adventure, big or small. They talk things out privately. She openly discusses being respectful to his feelings. I dig that, big time. She insists on couple time and electronics-down time. I applaud her and her future husband for making these points a priority in their life. In them I can see tomorrow. I am continually made breathless by your strength and inner beauty. As much as a parent tries to teach their children, I am always surprised and thankful at how much I learn from you. Happy Birthday, my Alex. I am honored to be your mother. The last time I had a gym membership women wore makeup, leg warmers and thong bodysuits. Apparently a few things have changed since then. For the last two decades I’ve been working out at home in my basement with a variety of hand weights, DVDs and VHS tapes, and the original purple and pink STEP climber. It screams early 1990’s and The Firm workouts, which I still own. When it’s not raining and the weather tops 50 degrees I’m outside either running or speed walking with hand weights. Not since high school cross country season have I had a solid, coordinated workout program that balanced cardiovascular exercise with weight training. I sort of made sure I did a little of both each week. Honestly I shy away from lifting weights and I’d rather run three extra miles uphill than do a single crunch. For years this routine had kept me in some decent shape. As I closed in on my 50th birthday, however, I started realizing that my standard routine wasn’t working anymore. There wasn’t enough incentive to push myself harder. My bad back required an adjustment of all core strengthening routines. Yet, I lacked the experience and training to know what that meant. Over the last several years I’ve talked about hiring a personal trainer, but didn’t. Flipping a decade is a great time to change something in your life. Do something for yourself. Do something for others. What I don’t want was to slowly let myself go to the point where other health problems begin to occur. If I let that happen it will create other burdens for the family. That will make me nuts! It was time to stop joking about my soft white underbelly. So now, I want everything to stay strong: mind, body and soul. I actually enjoy learning new things. I started a business two years ago. I can certainly start a new health regiment with the same vigor and determination. I loved my 40’s. I loved the way I felt as a woman and the confidence I held in life. Despite difficulties that we all face on a daily basis, I truly enjoyed life. I’m certain, however, that my 50’s will be my favorite decade. With that in mind I let my daughter Helen talk me into taking a tour at an L.A. Fitness club near my house. Four to five nights a week I pick her up from work and we laugh our way through runner’s highs and how I must be the only woman who could get hot flashes while swimming laps. Now I know what yoga addicts are talking about. I’m also working up the courage to take a spinning class. First we must address the issue of that tiny seat. For all the kidding around I do I actually enjoy the time to myself and the way a better regiment makes me feel. Something new, something stronger. For those who haven’t been to the gym in 20 years leg warmers are now called compression socks. They are like Spanx for your calves. I may never find every piece of statuary that my great grandfather Fidardo Landi, designed, carved or consulted on. I may walk through parks and cemeteries and suddenly feel his warmth, only to gaze at a piece and wonder if he had his hands on it. In recent years I have discovered enough information on his work, however, to write a book. He was a gifted carver. He preserved the glory and passion we all exhale in life in white Carrara marble and bronze. He pointed hulking blocks of marble with his pencil, leaving it dotted like a bout of chicken pox, and slowly chipped away in steady cadence. There was a rhythm to his routine. He sang as he worked. He sketched his dreams. While he did not need a lot of space to work his finished products were bigger than life. One cannot stare at a piece he had his hands on and not feel the energy of the story it tells. An artist will do that to us. When I look at newly found pieces today they continue to give me the same impression. They come to life before me. Before coming to the United States, Fidardo Landi worked in a studio in Carrara, Italy, his hometown, and managed a team of 20 to 50 people employed in the making of statuary for S.A. MacFarland & Company. They were the sculpting and carving division. These pieces ranged from custom-made sculptures to commercial statuary that were copies of well known pieces or remakes of cast away designs sold by other known sculptors. The pieces Landi supervised typically ranged in size from four feet to six feet high. Smaller commercial pieces were table top in size and sold for whatever the market could bare at the time. 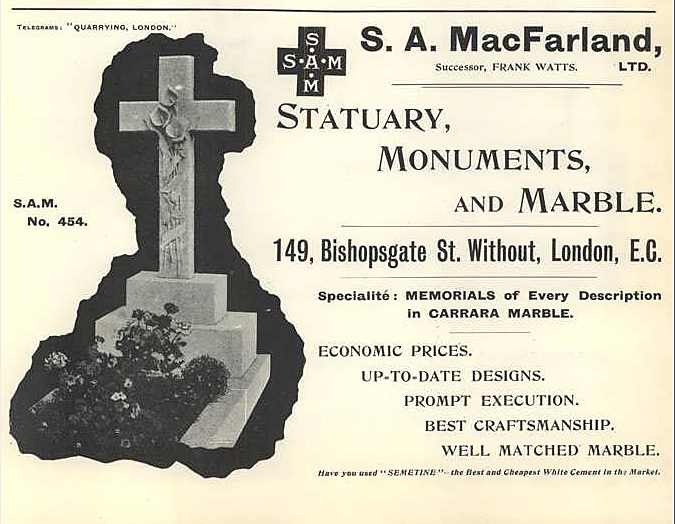 S.A. MacFarland had offices in Carrara, Italy, England and New York. 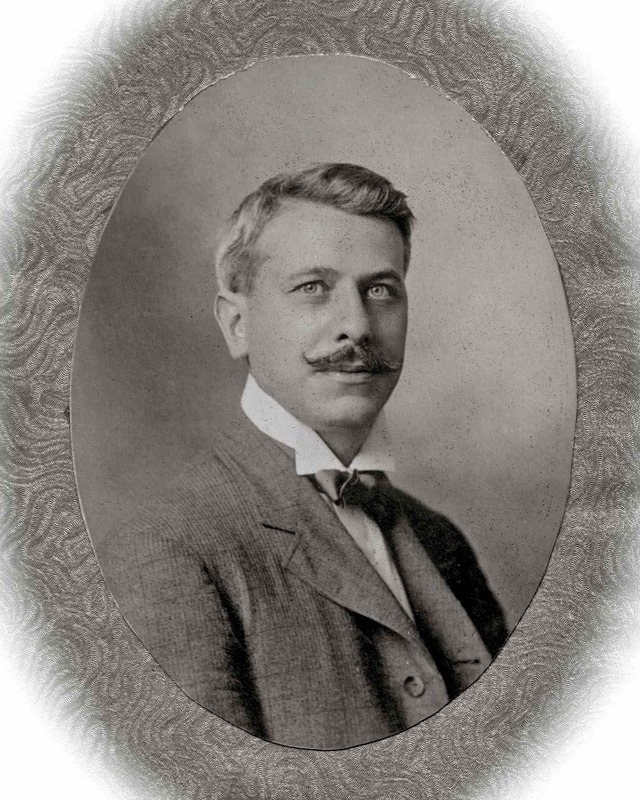 Mr. Wirt Leland was a representative of S.A. MacFarland in New York in a court case regarding artistic intellectual property rights that was settled in 1899. Ironically, Leland and Company was the company that sponsored Landi to immigrate to the United States on a commission to design a bas relief of President William McKinley in 1900, when Landi was just 36 years old. I know nothing of the work that S.A. MacFarland did in New York and Carrara. I’m hoping someone doing research will be able to share a bit of the company history with me. I’d love to know more about depth of work they produced in Carrara. Did they primarily produce statuary for public cemeteries? Was most of their work shipped to the United States and England? Did Fidardo Landi’s name appear on any work brokered for the company? How big was the facility that 20 to 50 sculptors and carvers worked? Was it a young company at the time? Or well established? Was Italy its corporate home? Did it provide its employees the freedom to be creative in their work? What became of the company? Did my great grandfather’s brother, I believe his name was Daniel Landi, work with him at S.A. MacFarland? So I’m putting this out there. Who can provide me with information? If we have met online, because of our mutual interest in artwork designed, created, started, carved, polished or consulted on by my great grandfather Fidardo Landi (1866-1918) of Carrara, Italy and New York City, I immediately considered you a friend. Family even. We share a passion for art. We are invigorated by the life that true artwork breathes. We love a good story. We are excited to meet someone with a mutual interest in the things we enjoy. I deeply value these friendships. I began this journey of searching for information on my great grandfather with my mother nearly 25 years ago. For awhile we were like two detectives, who started and stopped on a cold case. Over time my entire extended family chimed in on this quest, fueling us with the energy and support to continue searching. They are my cheerleaders. Without them Mom and I would not have realized this much of our dream. This journey for me is about documenting my family history. I don’t want to be intrusive. While this blog started out as a means to share family stories with my large extended family, it has evolved to be a source for others looking for information on Landi’s work. No one else has as much information on his work as Mom and I do. Fidardo Landi was no different. In 1900, he immigrated to the United States with a commission to create a bas relief of President William McKinley, set up his business, and struggled with the new language for the next 18 years. Even in his struggles he did masterful works. Work I’m still trying to find. I am often asked the following questions by art collectors: Why was this created; Who was it designed for; Are there others; Do you know if other collectors are planning to sell their artwork; is this true bronze or a metal combination; how can I get mine restored; how should I maintain it; is this white Carrara marble; What is my piece worth; Can I see photos of his other works; and what information can you send me. My goal is simple. I want to compile as much information as possible on my great grandfather’s work here in the United States to create a reference guide. Private and public owners of his work should know how valuable his work is in comparison to all that has been created. I want to compile a list of the commercial work he did in Italy, too. That, however, may require me to move to northern Italy for some period of time and, while I’m ready to go now, my family may not appreciate my absence. To that end, I will not ever publish you full name or address. I will not share your information with other collectors or entities unless you ask me to do so. I will do everything within my means to conceal your identify, including how I organize, store and backup my computer systems. I will not use any of your photos without permission. I want you to feel safe with sharing information with me. I want the same. I always wondered how my great grandfather’s work as a sculpture earned recognition here in the United States. 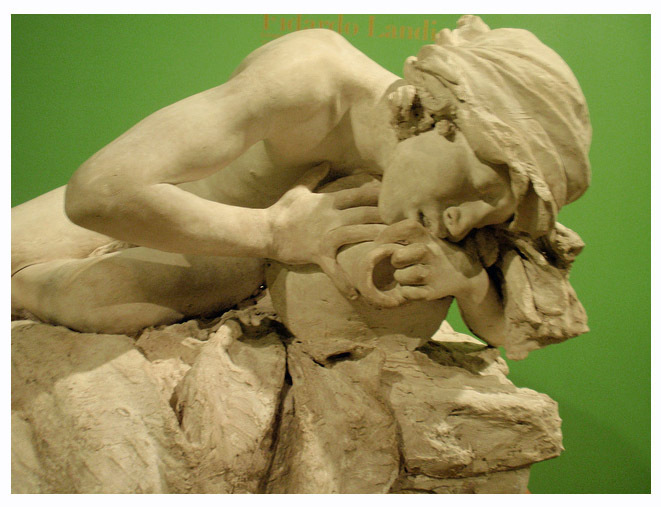 Fidardo Landi was an Italian sculptor whose work in Italy and the United States was just beginning to recognized prominently when he passed away on January 1, 1918. Now a 110-year-old court document that I’ve uncovered casts light on how other fine artists came to view his work. He arrived in the United States alone in 1900 with a commission to design a bas-relief of President William McKinley, the 25th president. Unfortunately the president’s untimely death withdrew the commission and Landi found himself in a new country, barely able to speak English. His work, however, spoke volumes for him. Landi adopted this country as his own and began to build a new life here. In Italy, he had worked for a period of time for a company in Carrara that designed and built statuary for parks, churches and cemeteries. Landi managed an entire division of sculptors who fulfilled orders across the globe to be chiseled in Italian marble. He also worked on his own sculptural designs. Based on my research, the company must have been the Wal-Mart of the day, churning out dozens of statuary each month that were shipped abroad. The company bought cast-off designs from notable sculptors in Europe and recreated them for the commercial market. It also produced custom design work. Needless to say, the company’s volume of work output drew the ire of fine artists with great derision and recalcitrance. When the company was challenged on its importing practices in the late 1890’s, declaring commercial grade product as original art to avoid significant import taxes, the art world in the United States got a first hand look at the craftsmanship of Fidardo Landi. At issue was how to properly appraise and assess duties chargeable on imported merchandise, particularly artwork. Original artwork was to be taxed for customs at a lower rate than commercial merchandise. The definition of original artwork was greatly debated in court testimony. Established U.S.-based artists took issue with Landi’s company, churning out what they considered second-rate sculptures by teams of workers using second-hand designs. They downplayed in their testimony the fact that Landi was a Prix de Rome winner for sculpture or that he mentored under Alessandro Biggi, dean of the Carrara School of Art and mayor of the city. There were casual compliments to his skills, but they pointed out that his studio was a ramshackle little office overlooking the marble quarry with one desk, a chair and a sculpting corner, as if one could not possibly produce great artwork without more space. Another challenge in the court testimony was the issue of control over design: how much and how frequently is a sculptor obligated to work on an original design in order to claim it his own. One artist challenged that Landi stole a design of his and claimed it as his own, but could never prove that he had any involvement into the design built process. That artist claimed to have sketched a design of a table-top statue and sent it to Carrara to be carved, but never touched it in the process, not even the fine tuning of finishing phase. Later he challenged that an eight-foot statue built by Landi was his own work. The court dismissed that charge, basically telling the protestor that he has a professional obligation to be responsible for his own work. Sculptors control every phase of the process, the court told him. It was also not possible, they determined, to proportion a table-top sketch into an eight-foot model in marble with the same depth of detail that the finished work required. As such, it could not be considered the protestor’s design, based on the evidence presented. A lower court decision ruled in favor of the Collector of Customs in New York and stayed the decision to tax imported commercial artwork at 20 percent. On appeal (Ferdinand Bing vs. Collector of Customs) the upper court reversed the decision in 1902 and ordered the Board of Appraisers in New York to reappraise works of art imported at 15 percent, rather than 20 percent, dating back to July 18, 1900. In its decision the court declared that all statuary, which is cut, carved or otherwise made by hand from a solid block of marble, alabaster, or other materials to be design built by a professional, school-trained sculptor to be a work of art. Several of the witnesses who testified against Landi’s Italian employer in that court challenge were privately impressed with Landi’s work. Ironically, one company later sponsored him to come to the country and design the bas-relief of McKinley. Several others became close friends and offered him subcontracting work until he could establish himself here in the United States. They include Daniel Chester French, and Charles Henry Niehaus. After the court decision, Landi was refunded a significant amount of customs taxes, petitioned for citizenship and sent for his family to join him in 1905. That’s where his U.S. story begins. My daughter, Alexandra, and my niece, Casey, recently took the trip of their lifetime to Italy. They flew to Rome, traveled to Carrara, met a distant relative who gave them a private tour of the city, the marble quarry and even the family cemetery. They met other relatives, took 2,000 photos, dreamed and fell in love with their history. Italy is where their much of story begins. I told Alexandra not to bring me home any souvenirs. This was her trip. She should buy something for herself. I wanted her to bring me back memories and stories. She knew I would inhale every single photo she shot. 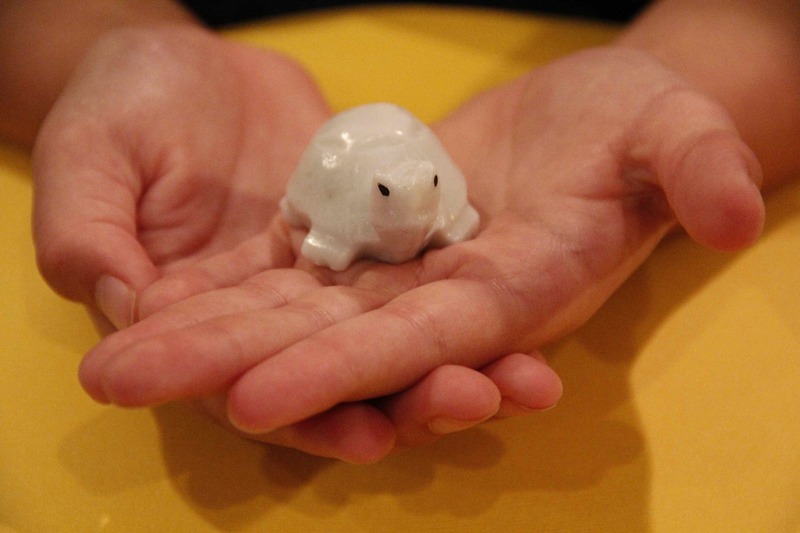 Upon their return, Alex gave me a small hand carved turtle in white Carrara marble, a rock from the motherland. I find myself holding it the way I do my rosary beads that were once owned by my great grandmother, Louisa Biggi Landi. Maybe I’m hoping for some special energy, or hidden wisdom to suddenly appear while I’m holding a fresh piece of white Carrara marble. It’s silly really. Alex and Casey took the trip I dream about making. I want to fly to Italy, and have someone drop me off in Carrara. I want to speak with restorationists at the Accademia Di Belle Arti about the work my great grandfather, Fidardo Landi, did in his youth that now sits in the local museum. I want to know what they learned – what they felt about him – during the restoration. I wonder how it compares to his later work. I want to know more about the life of a professional sculptor in Carrara during that period in history (the 1880’s to 1920’s). I want a full-day tour of a marble quarry, to learn about the process where giant blocks of mother nature’s finest artwork is mined from the center of the earth. I want to know what determines a good piece of marble for sculpture, in both hard and soft marble. I want to know what inspires a sculptor when they touch a block of marble, caressing it slowly to determine whether it is precise enough for the work they envision. I might need several days in the quarry, really, because I ask just too many questions. I want someone in town, a mayor perhaps, to tell me more about the vision of my great, great grandfather Alessandro Biggi, who proposed a widening of the roads around Carrara more than 100 years ago to make it easier for marble to be exported to the world. I want tour of his work, too. I have one photo of him wearing a full suit while standing on a beach with my grandmother, about 1910, and one very faded photo of him in his studio, shot from behind, while he worked on a bas-relief of a woman in a graduation cap and gown. I want to physically touch their public works of art without getting arrested or someone thinking I’m a vandal. (I will need the mayor for this part of the tour.) I want to spend the day on an eight to 10-foot ladder with cameras strapped on either side of me, shooting all the public works of art that are more than 15 feet in the area. I want to shoot every angle of their sculptures. It is in their close review that I see the life story come alive. I can see the tension in movement that both Landi and Biggi saw in their work. A statue of people should never appear to be fully at rest, but rather have a sense that it is about to move again. That’s what made their work so real. You can still see it breathe. Someday I will make that trip myself, after I learn enough Italian to speak with the locals and be comfortable enough to ask them a few questions about living in the city of art. I have to have patience. Until then I will remind myself of my great grandparents favorite expression: Chi va piano, va sana, e va lontano (Translation: He who goes slowly and swiftly, goes far.) Isn’t it funny that of all the items Alex could have brought me from Italy she chose a turtle, the one little item that could symbolize my patience with researching my great grandfather’s artwork. My babies at moments of discovery and laughter. A tiny yellow magnet with this saying was given to me at my baby shower some 24 years ago. I’ve tried to keep it in good shape so that I can hand it to my children at their baby showers someday. As life aged, so did the magnet. Plus the family dog chewed on it a few times, breaking off pieces of the particle board. I look at it now and laugh at how I tried to rescue a magnet by chasing a Jack Russell terrier around an acre and a half of property while attempting to discipline him at the same time. Oh. 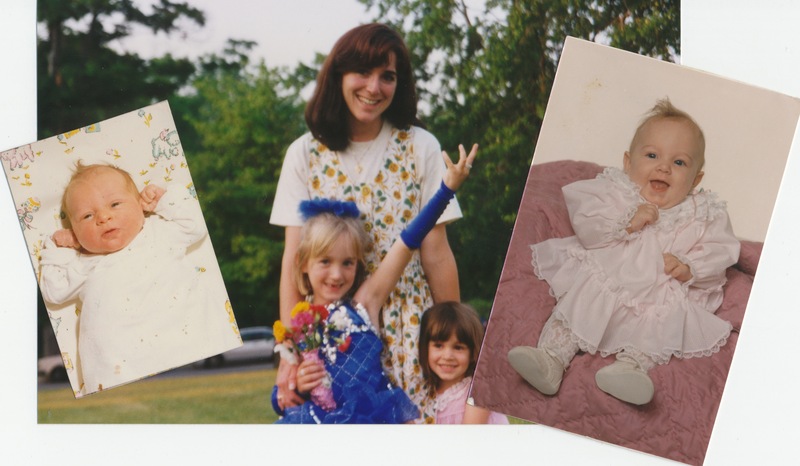 the lessons of motherhood I learned. While the particle board disintegrated, the message wasn’t lost. I have rewritten it in cards for every baby shower over the years. Children reawaken our sense of wonder: They remind us to be excited about the moments in life, such as lights on a Christmas tree, a warm bubble bath, rainbows, chocolate milk, snowflakes falling from the sky, ants on the ground, the first bright yellow dandelion picked, the wag of a dog’s tail and fire flies rising from the summer grass as the sun sets. They make small intentions seem like giant gifts. Their curiosity and wonder at every stage of life is refreshing. They reaffirm our belief in miracles: Pray and God will listen. Children believe all people are good first. Give them stability and they will have faith in a better tomorrow. They fill our lives with love and laughter: And giggles, toothless smiles, gawky teenager moments, pride, remembrance, toys all over the house, and plans, lots of plans about parties, time off, projects, forts and friends. 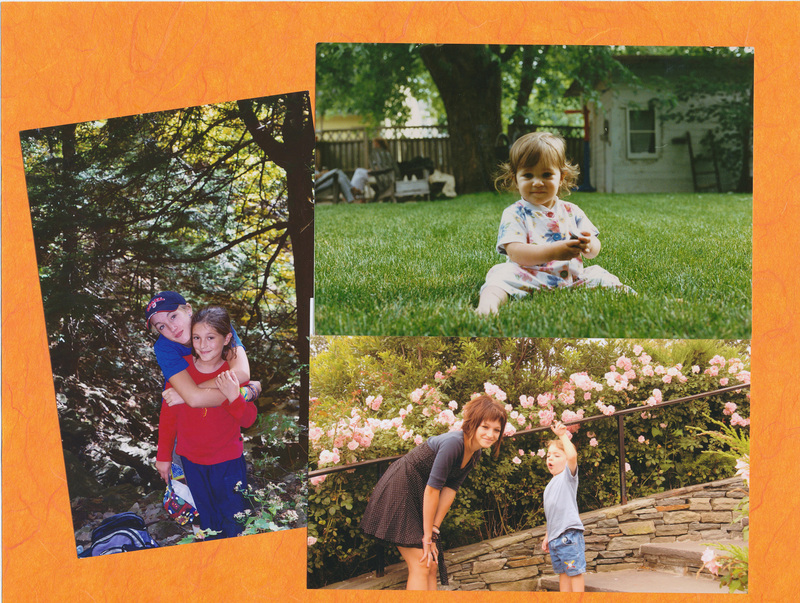 A parent’s favorite moments revolve around their children. They teach us to be silly again. They make the world a more beautiful place: Especially during the teenage years. There is nothing more beautiful than a baby smiling back at you, no matter how old they are now. I still see it in my mother’s eyes. I have been so blessed as a mother. I am thankful every day for the stages and transitions they go through. Mostly, I love the individuals they have become together. I mentioned this two years ago in a birthday message. It reminds me of the letter I sent my mother last year. To all the mothers, the caregivers, the people who nurture others, mothers to be, and those still wishing for the gift of life, I wish you all a wonderful and Happy Mother’s Day.